When the 18-year-old Mary Shelley decided to participate in a competition involving her husband and two other colleagues (including the famous British poet Lord Byron) centered on who could write the best horror story, she probably had very little notion that her story, which was reportedly based on a dream she had experienced, would be not only the obvious winner of the competition but go on to become one of the most celebrated and oft-imitated horror stories in Western Civilization. First published in 1818, Frankenstein, or the Modern Prometheus told the terrible tale of a scientist who created a monster and then suffered the disastrous consequences of such an action. Though it has been adapted for stage, screen and radio numerous times (including the campy but highly enjoyable Kenneth Branagh version made in 1994), there is one incarnation that stands above the rest: James Whale's 1931 masterpiece, which celebrates its 80th anniversary today. 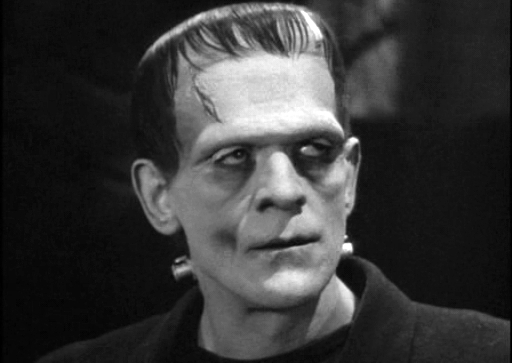 Released by the same studio as Tod Browning's Dracula and in the same year (a seminal one for monster movies it would seem), Universal's Frankenstein became a Hollywood classic for a variety of reasons, not the least of which was turning the unknown actor playing the large, mostly mute creature (an actor so obscure they didn't even include his name in the film's opening credits) into a major motion picture star. That actor's name was Boris Karloff. Initially, Bela Lugosi was cast as the monster but he turned out to dislike the part so much that he soon quit the picture and Karloff stepped in. Karloff's performance is the heart of Frankenstein. His stiff, lumbering movements and vast emotional mood swings (from innocent curiosity to angry, maniacal rages) perfectly captures the early development of a newborn infant. One of the most heartbreaking sequences of the film also is one of the most memorable: his tragic encounter with a young girl. Though despised by everyone he comes into contact with, the child is the first and only person not to respond with fear or antagonism to his frightening appearance. She invites him to sit and play with her, tossing flowers into a nearby lake and watching them float. The giddy expression on the monster's face betrays the first real feelings of joy he's experienced since his creation, but it is short-lived. Once the flowers are all gone he stupidly picks up the girl and tosses her in the lake, drowning her in the process (a scene whose second half actually was censored upon original release). He quickly realizes he's done wrong and runs off with a look of fear, panic and confusion on his face, like a toddler who's just broken his mother's favorite vase and knows he's in trouble. It's a tremendously sad moment and not just because of the death of the child but because of the pathetic nature of the monster. Through his ignorance and foolishness, he destroyed the one thing in his life that offered him genuine unconditional love. Karloff's creature is one of the saddest and most sympathetic monsters ever put on screen. 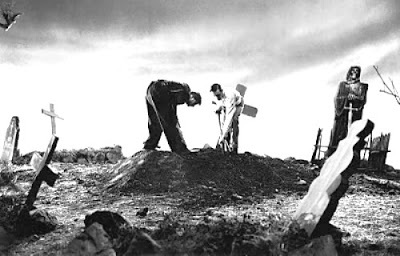 Some have speculated in recent years that the monster's lonely and persecuted existence served as a metaphor for director James Whale's own feelings of isolation as a homosexual. The cast surrounding Karloff also is quite good. Colin Clive's portrayal of the obsessed scientist is as equally memorable as Karloff's performance (his declaration of "It's alive!" is forever etched in cinematic history). Dwight Frye plays Frankenstein's hunchbacked assistant Fritz with the same gleeful malevolence with which he played Renfield in Browning's film (it's almost as common to mistake Fritz's name for Igor as it is to assume Frankenstein is the name of the monster rather than the doctor). Another Dracula alumnus is Edward Van Sloan (Van Helsing) who once again plays a scientist in Whale's film, though one who meets a far more inauspicious end. Van Sloan also appears in a prologue warning more sensitive audience members of what they're about to see. Interestingly, Van Sloan performed a similar act at the conclusion of Dracula in its initial run. Like the prior Dracula film, Frankenstein was based not primarily on the author's original novel but on a theatrical adaptation by John L. Balderston. Unlike Browning's film, however, it bore very little resemblance to its source material. Beside the essential premise and the names of a few of the characters, this Frankenstein was a work of total imagination. For example, details about how the creature is brought to life in the book are exceptionally few. 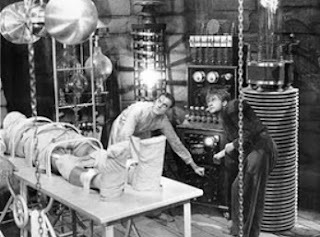 This makes the legendary birthing sequence (brilliantly parodied in Mel Brooks' affectionate 1974 spoof Young Frankenstein), wherein Dr. Frankenstein uses the natural elements such as thunder and lightning to animate the lifeless corpse lying flat on the platform being lifted up high into the air while sparks of electricity fly noisily from various mechanical apparatuses all the more impressive. Likewise, the creature's appearance is radically different from that described in the book but no less creative and memorable. The now instantly recognizable look of the monster (the bolts on the neck, the flat head, the green skin, etc) was designed by make-up artist Jack Pierce, the man also responsible for yet another Universal monster a decade later — Lon Chaney Jr.'s Wolf Man. Needless to say, Frankenstein was a huge hit upon its release, but unlike a number of other Hollywood classics which now are dated terribly, Whale's film still holds up incredibly well. One of the qualities that makes it so watchable are the amazing visuals. Clearly inspired by German expressionism, the stark and at times surreal look of the film contributes to the dark Caligari-like atmosphere. Whale was a theater director before he did cinema and he brings a theatricality to the film that helps make it more chilling and captivating. Whale would go on to direct the sequel Bride of Frankenstein (considered by many to be ever better than its predecessor but still unseen by me) and Universal's The Invisible Man. Whale tried to distance himself from his horror films later in his life but his career faltered and he eventually committed suicide in 1957. He even got his own film in 1998 in the form of Gods and Monsters where he was was played by openly gay actor Ian McKellen, who has admitted that he identifies very strongly with the struggles of the talented filmmaker. 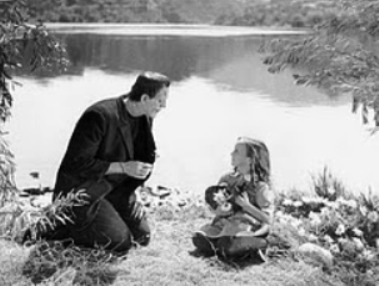 Regardless, however, of the obscurity or notoriety of Whale's more "serious" output, his horror work is among the best of the genre and Frankenstein wouldn't be the celebrated classic it is today without him. It also makes sense that the story of Frankenstein itself (as originally conceived by Shelley) wouldn't be as remembered today as it is without Whale's film. It's ironic that a story which warns against the dangers of man trying to achieve immortality shows no signs of "dying" anytime soon. In a way, Frankenstein and Bride of Frankenstein were the Texas Chainsaw Massacre and Texas Chainsaw Massacre 2 of their day (except I love both of Whale's films whereas I'm not that crazy about the original Chainsaw). Frankenstein is the more complicated, straight-forward horror tale. Bride is its comedic sequel. I think its the comedic quality of BRIDE that makes it not quite as appealing to me as the first one. I never tire of watching FRANKENSTEIN. Yes, it's broad and melodramatic but it takes itself seriously. BRIDE just seems... silly.